Can Democrats Hold On To State House District 176? Wednesday, state Representative Jay Shaw (D - Lakeland) won election to the State Transportation Board from the 1st district [Jones, Walter C (2010-2-18). Open seat filled on Georgia transportation board. Florida Times-Union. Retrieved on 2010-2-19.]. The Valdosta Daily Times reports that Shaw will finish out the 2010 legislative session before giving up his seat to serve on the DOT board [Pope, Jessica (2010-2-17). Rep. Shaw joins transportation board. Valdosta Daily Times. Retrieved on 2010-2-19]. With Rep. Jay Shaw's impending departure from the legislature, Democrats must be wondering if they'll be able to keep control of the south Georgia seat. 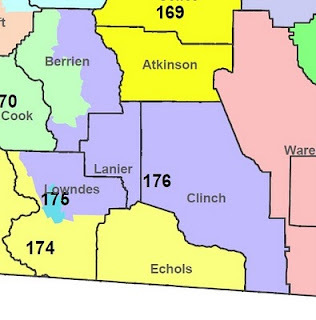 House district 176 covers four counties near the Georgia/Florida border. While Jay Shaw has never really faced a strong challenge from the GOP in his district (Shaw has run unopposed in three of the last four elections), other Republicans --including John McCain, Saxby Chambliss, Sonny Perdue and George W. Bush-- have performed well there. In the past four elections, the Republican at the top of the ticket has averaged 59% in the 176th district. It appears that voters in Jay Shaw's district are loyal to the person and not the party. If that's the case, then the Democrats may have a tough time holding on to the south Georgia seat. However, a strong candidate --like maybe a local mayor or county commissioner-- might keep the district Democratic. Now would be a good time for the county Democratic Party chairs in House district 176 to start working with the House Democratic Caucus to recruit a strong candidate.